Havering & Brentwood Counselling Services is proud, once again, to be fielding a team for the Brentwood Half Marathon and Fun Run in March. And we’re on the look out for people who want to support the communities of Brentwood and Havering by taking part in either race for our charity. Events such as this provide vital fundraising for HBBS through sponsorship generated by those taking part and all of this is used to support the crucial counselling we offer to primary secondary school children across our area. These services help hundreds of young people each year who are struggling with the loss of a parent or relative. Katy O’Keefe, the Events and Fundraising Officer at HBBS organises all fundraising events for the cause and is currently heading up recruitment for the races on March 17th. “The money that is raised at the Brentwood Half Marathon is used for our primary and secondary school counselling services within the local community, this is offered in their own school setting or in the privacy of our counselling rooms in Brentwood and Hornchurch,” she revealed. “Last year we were able to deliver nearly 3000 sessions as a result of our fundraising efforts and the generous donations from people. Putting their money where their mouths are, the O’Keefe family will be taking part in the Fun Run this year and Katy is willing others to join them in support of HBBS. She said: “The Brentwood Half Marathon is a lovely setting for this event as the route takes you through a number of quaint villages and the atmosphere is very encouraging. “The fun run is a two-point-nine mile run fit for all the family over eight years old. Katy’s other responsibilities at the charity include organising the KiiT Club (Kids In It Together) for children (and siblings) who have been through the counselling service which offers a variety of different social events for them to enjoy which is funded by grants and private donations. Katy added: “If you would like to join the Havering & Brentwood Bereavement Service team for the Brentwood Half Marathon and Fun Run, you'll be running to make a big difference to other peoples' lives across the area. If you'd like to become part of our #HBBS Half Marathon team all you have to do is click on the link below to register your entry, then just let us know and we will arrange everything else for you. Please note: You do not need to pay for a t-shirt when you enter via this website as we'll provide you with this. To sign up for the 2.9 mile Fun Run simply click on the link above & go to 'Fun Run Entry'. Again, we will provide you with a t-shirt. Once you have completed your online entry please email katy.okeefe@hbbscounselling.org & you'll be sent an HBBS registration form. New Havering & Brentwood Counselling Services (HBBS) Chief Executive Officer, Emma Tierney, has vowed to continue building upon the charity’s “excellent” counselling work with adults and young people across the area. Mrs Tierney - a trained counsellor - is also keen to promote the continued expansion of the areas outside of bereavement although that remains a vitally important aspect of the charity’s work. HBBS - which was founded in 1989 - offers counselling to adults and children across the area for a range of issues including bereavement, stress and anxiety, depression, phobias, family breakdowns, trauma and support for family carers. In the last financial year HBBS provided almost 3,000 counselling sessions to people across its catchment area. With 2019 marking the 30th anniversary of organisation, we spoke to Mrs Tierney about her plans for the year ahead and ambitions for Havering & Brentwood Counselling Services going forward. She said: “My main ambitions for Havering and Brentwood Counselling Services are to continue the excellent work it carries out supporting children, young people and adults struggling with difficulties. “In the last financial year we provided more than 2915 sessions which is incredible and just goes to show how much of a need there is for high quality counselling support. “As a charity we are a member of the professional body BACP (British Association for Counselling and Psychotherapy) and I would like to move to the next step in gaining accreditation status for our counselling services too. “In the past Havering and Brentwood Counselling Services provided bereavement support only; we now provide much more than this. Some of the other projects we run are counselling support for dementia carers in Thurrock and counselling for adults, children and young people with difficulties around areas such as depression, anxiety and stress. The charity’s counselling work is funded by grants from organisations such as Children in Need and Big Lottery, fundraising events and donations from members of the public. Mrs Tierney explained how people wishing to support the charity in the year ahead can get involved. “Members of the public are hugely important in helping us to continue to be able to provide our counselling services,” she explained. “We have the Brentwood Half Marathon coming up in March and we are looking for people to help by running for us. With plans for the 30th anniversary underway, Mrs Tierney revealed plans for the year ahead. “I think our 30th anniversary shows how much our services are needed and respected by the local community and our funders. “We will continue to highlight and raise awareness of what we do to reach as many people as possible who need support. “We will also work to develop new as well as existing partnerships to ensure our services are around for another 30 years. If you would like to take part in the Brentwood Half Marathon, Fun Run or support Havering & Brentwood Counselling Services in another way, email katy.okeefe@hbbscounselling.org or call 01277 283190. The Chair of the Board of Trustees at Havering & Brentwood Bereavement Service, Sue Newth-Gibbs, takes a candid view of some of the achievements, opportunities and challenges at the charity over the past year. “As we enter year a new at HBBS I thought it would be an ideal time for me to reflect upon what has been another exciting and successful 12 months. We have had more referrals and more sessions for counselling in this very busy year and that trend looks set to continue. The Clinical Team led by Lisa Mason-Gates have done a great job throughout the year as the jigsaw puzzle of taking calls and matching clients to counsellors gets ever more complex. Thanks to our very own Louise Mundy and Kate O’Keefe for organising so many successful events and associated fund raising is going from strength to strength with a Tea Party, the Annual Ball and the KITT Club events and more is planned for our 30th anniversary this year. As always we are grateful to our funders including Children in Need and the Reaching Communities (Big Lottery), also individual donations from Rotary, Martin Hughes and many others. 2018 was also ‘the year of networking’ for us, otherwise known as getting ourselves “out there”. The Mayor of Brentwood and the Deputy Mayor of Havering attended our AGM, the Mayor of Havering and the Deputy Mayor of Brentwood attend the Ball. We enjoyed visits from the High Sheriff for Essex and Brentwood MP. Eight of us were invited to the Houses of Parliament to meet Mr Speaker John Bercow and Alex Burghart our local MP. Team HBBS attended the Mayor’s Christmas Party at Ingatestone Hall and her Carol Service at St Nicolas Church. We are also invited to meet with the Chair of Essex County Council in January 2019 to discuss our work with schools. I am very pleased to see Louise Mundy receive the Highly Commended Award in the Ultimate Volunteer category at the Pride of Essex Award ceremony 2018. One further piece of exciting news is that we have been nominated for the Queens Award for Voluntary Service. This is the organisational equivalent of an MBE and we will know the outcome in mid 2019 (so fingers crossed). In November we said goodbye to Karen Egglestone our CEO and welcomed her successor Emma Tierney. Emma holds accredited BACP status and this provides us with the opportunity to seek accredited status for HBBS. This recognition could have a huge impact on us as it would give us access to new areas of work and projects. Last year has provided a number of challenges including closure of the Extended Schools Programme, end of the Brentwood NHS contract and the loss of bonded status for the Brentwood Half Marathon. But as always HBBS rose to the occasion, school contracts are increasing, the paying client service is growing and even the cancellation of the BHM still brought in donations. No doubt 2019 will bring new challenges but financially and structurally we are in a good place to meet them and will continue to be able to support the local community with the professionalism and quality service that is the hallmark of our organisation. 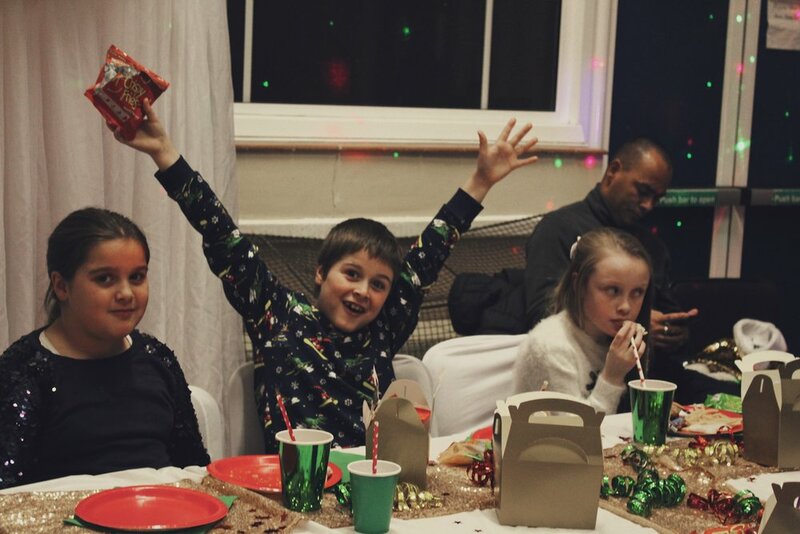 A fun festive time was had by all at a special Christmas party for children who have benefited from the services of Havering & Brentwood Counselling Services. Some 25 children from HBBS’ “Kids in it Together Club” (KiiT) met special guest Father Christmas who treated each with a gift and a dose of festive spirit on December 10th at Upminster Methodist Church. With faces painting and the DJ playing a host of Christmas tunes, even Santa Claus himself couldn’t resist leaping up to cut some shapes to the 1970s party classic YMCA in front of a joyous audience of children, parents and HBBS helpers. And to end the event every young guest was presented with a special balloon to release in memory of a loved one. Katy O’Keefe, Events & Fundraising Officer at HBBS said: “The children had a lovely time playing games, dancing and having a catch up. To find out more about the KiiT Club and HBBS browse our website or call 01277 283199. Volunteers and staff at our charity, which offers vital counseling support to children and adults across Brentwood and Havering, were given the “surprise of a lifetime” after landing an unexpected 45 minute audience with John Bercow while on a group tour of Parliament. Members of the team at Havering & Brentwood Bereavement Service met with The Speaker of the House of Commons for an unexpected “chat” after completing a public tour of the historic Westminster chambers last week. The rendezvous was arranged by Alex Burghart, MP for Brentwood & Ongar, who was impressed by the charity’s work after making a visit to their offices in William Hunter Way last December. Havering & Brentwood Bereavement Service has given more than 800 counselling sessions to school children across its catchment area in the past 18 months alone. It now has a waiting list of young people who are seeking help for issues including bereavement, depression, anxiety and self harm and is seeking funding to secure the service into the future. The trip to Westminster was arranged by the Deputy Lord Lieutenant of Essex Dennis Rensch, MBE, a long-term supporter of the cause who approached Mr Burghart earlier this year. Chair of the Board of Trustees at the charity, Sue Newth-Gibbs, described the meeting with Mr Bercow as an “eye-opening, tremendous surprise”. The eight-strong delegation from HBBS, made up of volunteers, counsellors, and support staff, also had the opportunity to put questions to Mr Bercow, who has held the post for nine years. Mrs Newth-Gibbs added: “The look on some of our team’s faces were priceless, the tour of the Commons and the Lords was enough but this made it all extra memorable. “Bear in mind that this was Budget day and after about 15 minutes one of Mr Bercow’s assistants came in to remind him that he had another appointment, but he carried on chatting to us for another half an hour, we couldn’t believe it all. “I have to say, I was very impressed with Mr Bercow who seemed extremely well-versed on the work of our charity and he offered us some great advice on how we could build upon what we’ve achieved so far by building a corporate strategy and working with local influencers. The Deputy Speaker Lindsay Hoyle, MP, presided over the Budget session on the day. Havering & Brentwood Bereavement Service was founded in 1989 and will celebrate its 30thanniversary in 2019. It will also be marking its tenth year of providing counselling services for children next year. Despite the charity’s name, it offers a range of counseling services to adults and children for issues such as depression, anxiety, phobias, relationships problems, family breakdown, parenting and trauma. The charity relies upon grants, donations and events to fund these services.